Premier Express employs two-technician teams to get the work done. Mercedes also is phasing in a digital service to book appointments. Mercedes-Benz is rolling out quick service for basic maintenance that can be completed in as little as 30 minutes. No appointment is needed. The program, Premier Express, was piloted last year and will go nationwide in the first quarter. It was "created to address one of the biggest pain points for our customers -- time," said Gareth Joyce, vice president of customer services for Mercedes-Benz USA. Dealerships assign two-technician teams solely to do express work, Joyce said. Customers whose vehicles need lubrication, filter changes and other basic maintenance can arrive without an appointment. They'll be on their way in 30 minutes if they don't want a free car wash and 45 if they do, the company says. More complicated maintenance, such as brake work, takes 45 minutes without a wash and an hour with. "We set up a workshop process that can deliver this," Joyce said. The program was tested at a small number of dealerships last year. Premier Express isn't mandatory, but Mercedes has recommended that 240 of its 360 dealerships -- all but the smallest with the lowest volume of service work -- offer it. Joyce said 160 dealerships have agreed, and he expects the remaining 80 to do so by the end of March. "To qualify as a certified Premier Express dealership, you have to perform the work through our prescribed process, inside the required time with and without an appointment," Joyce said. Mercedes has given Premier Express standardized service codes to track these jobs separately. Initial data show that customers score the dealerships offering the service 10 points higher in Mercedes' satisfaction surveys, Joyce said. Stores that have been offering Premier Express for three months show a 40 percent increase in service business, he said. The service is drawing customers with vehicles that are older than four years -- frequently the second, third or fourth owner of a car -- who had gone elsewhere for service, Joyce said. Normally, customers have to make an appointment and either wait or take a loaner car or alternative transportation and return hours later to pick up the vehicle. Dealerships have to use a two-person team to work Premier Express vehicles, and these technicians do not perform other service work, Joyce said. "We changed the workflow, and we find the two-man team is an efficient way to get it done." Most stores use at least two teams, he said. Dealers are hiring younger, less experienced technicians to do the Premier Express work. Benzel Busch Motor Car Corp. in Englewood, N.J., one of the pilot stores, has put a computer station into the service area so when a Premier Express technician isn't working on a car, he can access Mercedes-Benz's Web-based service training, Joyce said. 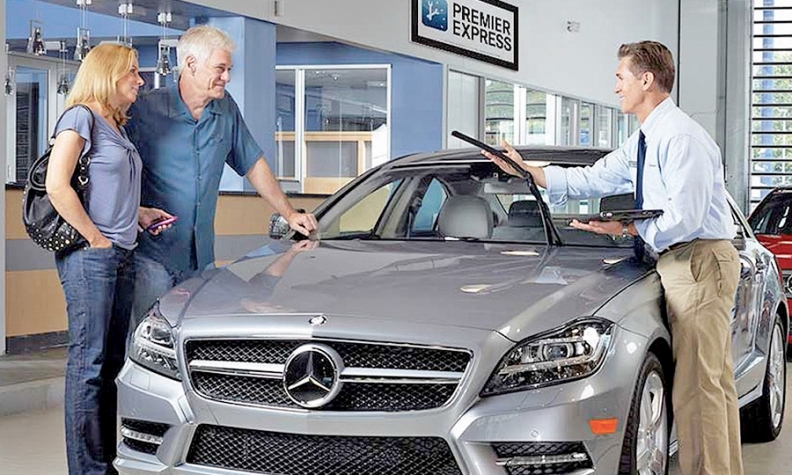 Initially, Mercedes is marketing Premier Express locally and will shift to a $2 million national program later in the first quarter and through the second as more dealers offer Premier Express, he said. Mercedes also is phasing in a Digital Drive Service with an initial 20 dealerships. The program will be phased in nationwide later this year, Joyce said. Using the Mercedes app, customers can book an appointment and select a service -- including Premier Express -- and note whether they'll wait or need a loaner car or alternative transportation. Customers get text messages if the vehicle needs extra work -- the cost is indicated -- and they can authorize it digitally. A text is sent again when the work is completed with a link to an invoice, allowing the customer to pay online. The program doesn't require an additional investment in technology, and dealers can use their own dealer management systems, Joyce said. Mercedes expects about half of its dealerships to sign up by the end of the year and to have the entire network on board next year, he said.